How to Pack a Suitcase for the Perfect Holiday! Every day is holiday season in Queenstown, so being prepared to pack the perfect suitcase is a year round necessity! And you’re in luck, here at Queenstown Holidays we’ve packed a suitcase or two and we’re sharing our best secrets so you can get the most out of your New Zealand experience! If you pack everything you want you’ll never end up using it all. So go by the three tops to every bottom formula – trust us you can repeat a pair of pants or a skirt and you may even pick up a few pieces at your destination. You should always be able to get your hands on an iron in your hotel or resort, but is ironing really want you want to do on your getaway? Probably not. In that case opt for clothing made of lycra, nylon, or polyester which can be worn after being pulled out of suitcase with relative ease. Both wool and stretch cotton are great if you prefer a natural option. Another trick is to pack clothing with ruching or busy patterns as it helps in hiding fold masks. There are several reasons properly preparing your carryon luggage is essential, depending on your travel time you will need your toothbrush and paste, a face wash or wipes, and potentially pain killers if the in-flight children wish to sing you the song of their people. Flights can also get quite cool so pack a light jacket and a days’ worth of any prescriptions and a change of underwear – that will also cover you in case your luggage wanders! In deciding whether to fold or roll determining the type of suitcase and luggage are key. In duffel – roll everything. In a suitcase you have the luxury of folding some items that have structure such as blazers and trousers. But in general rolling will save you the most space which is especially handy when your packing large and bulky snow jackets for ski season. Using packing cubes have three main benefits, they efficiently use the available space, they allow you to separate your underwear from your swimmers, and give you an isolated place to store dirty laundry as you go. We have a great, sneaky trick for this – if you have some clothing that’s prone to creasing, simply place a garbage bag down first, and then on top of your layer, the slippery surfaces make it harder for wrinkles to set. 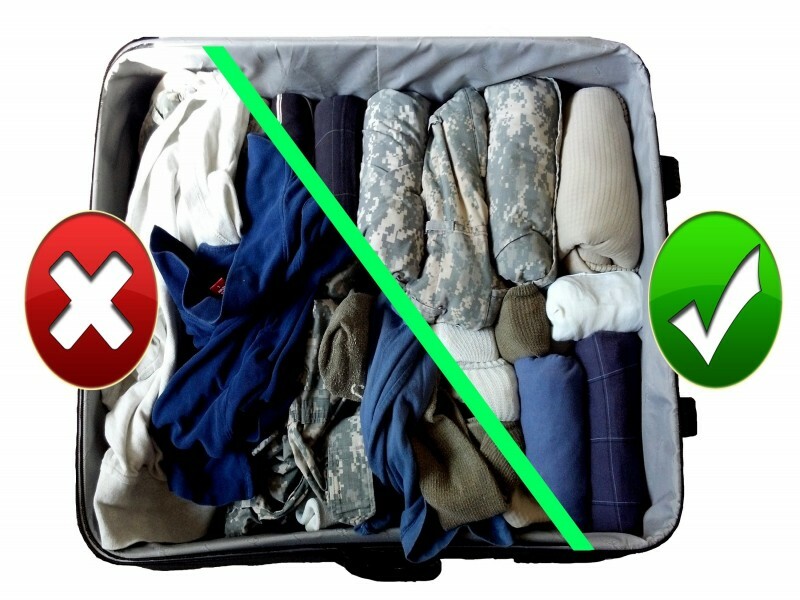 To prevent crushing delicate items and make your bag as easy to roll without toppling as possible pack your heaviest items such as shoes and toiletries near the wheel base with packing cubes next followed by folded clothes, then rolled garments, finally bulky sweaters can be packed last as a surround for any delicate items. Fill your shoes with socks, wrap belts around the perimeter of your suitcase, stuff your bra cups with underwear (this doubles as a good trick to keep the shape of your bra intact), put your jewellery in pill boxes or use the side pockets of the bag. You will be pleasantly surprised how much extra space you’ll find in your bag by making the most of your suitcase. Lastly, don’t forget to weigh your checked suitcase so you don’t get a nasty surprise at the airport! An easy way to do this without luggage scales is simply jump on your bathroom scales, weigh yourself then get back on with your luggage. Similarly remember to measure the dimensions of your carryon luggage and check the website of your carrier to ensure it fits the criteria. Happy holidaying from the team at Queenstown Holidays!